All our partner sites are independently reviewed by our team of industry experts. We examine 10 different criteria and award a score out of 10 for each, adding up to a final mark out of 100. You can read a full description of our 32Red Casino review process here. 32Red Casino received a score of 92/100. 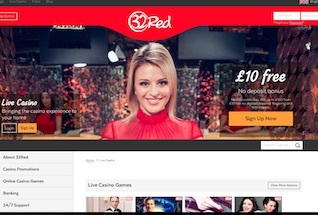 32Red Casino is a favourite amongst online gamblers. It is a regular award winner – previously Casinomeister’s Casino of the Decade – has sponsored three different Premier League and Scottish football clubs – Swansea, Aston Villa and Rangers – and is listed on the London Stock Exchange. The brand launched in 2002. Why are they so popular? Well from the very beginning 32Red set out to put the customer first in every aspect of their business. That meant a first class product offering a vast variety of games from all the top game providers and on every available platform. Their promotions are generous and tailored to the individual player, based on the preferred games of that customer. Their customer services is award winning. They suit the VIP customer with account features like manual flush – where a player can request to have their withdrawal fast tracked through the casino system. 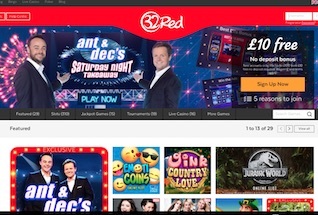 Since 2002 32Red have also added Sportsbook, Bingo and Poker to their product offering, so there is something for everyone. And of course, currently they join the trend of casinos offering a free £10 no deposit bonus to welcome players through the door. Enjoy yours today when you join now, or read on for our full review of 32Red Casino. So, let’s start with that free £10 welcome bonus from 32Red. It comes directly on registration, with no deposit required. Simply sign up and the £10 will drop into your account. There is a 50x wagering requirement that must be met before any withdrawal can be made, and the maximum withdrawal from this offer is £100. Slot games contribute 100% towards the wagering requirements, whilst table games and other games contribute 50% or less – see the 32Red site for full details. Following your registration bonus, 32Red also offer a nice first deposit bonus of £32 extra on every £10. So, deposit £10 and get £32 extra, deposit £20 and get £64 extra. The maximum bonus awarded here is £160 on a £50 deposit. After registration each player has 7 days in which to claim this bonus. There is also a 40x wagering requirement on the bonus that must be met before any withdrawal of funds can be made. Slot games contribute 100% towards this wagering, and table and other games will contribute 50% or less – see the site for full details. So, moving on to the games selection at 32Red, this casino is what you would call a pure Microgaming-powered casino. There are only games produced by the Microgaming studio. But that is not a problem when you consider the sheer volume and quality of games produced by Microgaming in recent years. For slots fantatics, alongside the absolute classics like Immortal Romance, Lost Vegas and Thunderstuck II, are the very latest and best from this industry giant. Highlights of the 2017 game catalogue include Pollen Party, Castle Builder II, Beautiful Bones and Oink Country Love! These games all feature super graphics and animations and offer something for every type of slot player, from the low variance slower-paced slot to the super risky high volatility game for the high rollers, all bases are covered. Of course, Microgaming are known for their big Progressive Jackpot, and all the best are available on 32Red’s casino. That includes the Mega Moolah jackpot, LotsaLoot, King Cashalot, Fruit Fiesta and Tunnzamuni. Meanwhile, for table game players there is a lot of great action here – including 10 Roulettes and 26 Blackjacks, and 4 High Limit (Max Bet) tables. You can also try your hand at games like Baccarat, Hold Em and Caribbean Stud. There is a choice of 16 Live Dealer tables at 32Red Casino. You know what to expect – Roulette, Blackjack and Baccarat. Plus VIP tables where the high rollers can sit. These tables include Speed Roulette, Double Ball Roulette and Roulette Gold. We’ve already seen the generosity with which 32Red treats its new players. But what do existing customers get? Well, at time of writing there were a good selection of top promotions available. Dish of the Day – This is a regular daily deposit bonus. Just log in and see what each days tasty treat is. Make sure you optin when you deposit to claim your bonus. £15k Slots Shootout – Two of 32Reds most popular slots face off each day. Choose your side and earn points by wagering. Collectively, the team with the most points at the end shares a prize pool each day. Game of Thrones Giveaway – Get a 10% exta boost on your Game of Thrones Slot winnings, or a 10% cashback on losses. Every weekend. These are just a small selection of the great offers at 32Red. 32Red’s Casino is renowned for putting the customer first. In the case of Customer Services, this philosophy takes shape in the form of a comprehensive Help Center, with easy-to-use FAQs, and important touch points like Send Us Your Documents for ID verification. There is also telephone, email and live chat available. There are a whole host of options available in the cashier at 32Red. These include the standard debit and credit cards alongside eWallets like Neteller and Paypal, and voucher systems like Paysafecard. The withdrawal pending time is 24 hours, though 32Red do offer manual flush – quick processing for VIP players. 32Red’s reputation in the industry and amongst players is well deserved, and is reflected in the quality of their product, on both the games and the website. Finding your way around this casino is easy to do, and all the important touchpoints – games, account, registration and customer support – are within 1 or 2 clicks of the homepage. The 32Red site renders beautifully on mobile and tablet on both Android and iOS. And like all Microgaming-powerered casinos, the games it offers are built on HTML 5 and can be played on any device. 32Red Casino is licensed in the UK and Gibraltar and adheres to strict guidelines on fairness and security with regards to gameplay and financial transactions.